When it comes to chronic neck pain, many people automatically think injuries, accidents or other extreme events are always to blame. 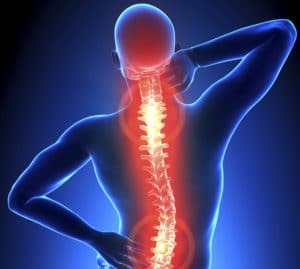 Statistics find that approximately 80% of all adults suffer from either back or neck pain over the course of their life; this often amounts to huge medical bills and painful medical procedures such as surgeries or injections. Those with neck pain often complain of extreme stiffness in the neck or subsequent pain whenever they try to move. There is often a secret culprit behind the chronic and debilitating pain in our neck. Poor posture can affect anyone of any age. The symptoms often begin very slowly, but over time, serious neck issues often result. “Awkward” body positions and unhealthy posture gradually deforms the normal “s-shape” curve of the spine, leading to complications such as “subluxations” (misaligned vertebrae), blood vessel constriction, pinched nerves, and herniated discs. In addition to damage to the spinal column, unnatural pressure on the “sternocleidomastoid“ and “trapezius“ muscle groups may also cause lasting damage to the neck and upper body. At the first sign of neck pain, always seek help. The longer you wait, the greater the potential damage. Although anyone can suffer from poor posture, several groups are at greater risk for posture-related neck pain. Treatment options and pain relief vary according to the severity of the pain you are experiencing. Milder, short-term cases of neck pain are often easily treated with anti-inflammatory medications, stretching, and physical therapy. Those with more severe, debilitating pain often seek surgical intervention or pain-relieving injections. In addition to physical therapy, we can eliminate many cases of neck pain and even prevent future relapses by actively guarding our posture and using proper body alignment. Replace poor posture with healthy, natural positions that minimize the pressure on our neck. 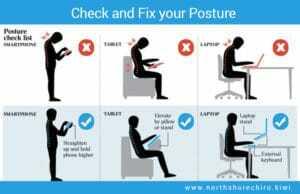 Minimize slouching or “hunched” positions when standing or sitting; make good posture a daily habit. When standing, you should be able to trace a straight, imaginary line down from your shoulders to your hips. This shows that the natural spinal curves of your hips and shoulders are properly aligned. When sitting, keep your neck vertical and resist the urge to “bend down” or slouch. Keep your feet flat on the floor and your knees bent at 90-degree angle in front of you. In both positions, keep your shoulders and arm relaxed and be on guard for tense muscles. Always take breaks from any sitting or standing position and move around. This prevents your muscles and joints from feeling “frozen” or locked into place for too long. Sit up straight on a bed or flat surface with your legs relaxed in front of you. Place one hand on the small of your back with your palm facing outward. This should be on the side with the greatest neck pain. If your neck is too painful, keep your hand resting on your lap instead. Place your other hand on the top of your head with your fingertips just above the opposite ear. Gently use this hand to ease your head away from the side with the most pain. For instance, if the left side of your neck hurts the most, you should stretch your head to the right. Hold the stretch for 15 to 30 seconds if you are able. Release the stretch and return to an upright position. Repeat about 3-5 times depending on your pain and stiffness. Stand in front of an empty corner or open doorway. Place your hands on the sides of the frame firmly and slowly walk towards the center. You should feel an increasing stretch across the front of your upper chest and shoulders. Keep your body as vertical as possible and avoid “hunching” or bending your head downward. Stop and hold for 15 to 30 seconds and repeat between 4 to 5 times. Using a Theraband or a similar resistance band, thread it through a doorway or another stable anchor. Be sure both ends of the band are even. Stand upright with your body braced and pull backward with your arms at a tight 90-degree angle. 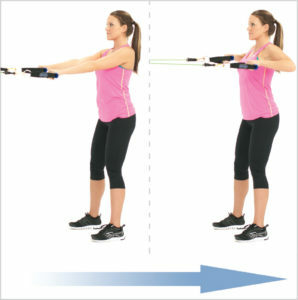 After pulling backward, tilt the stretch slightly down until you feel a “pull” across your chest and shoulders. Release the stretch and repeat several more times, but stop if experiencing any extreme pain or stiffness. Secure one end of your Theraband to a stable anchor such as a doorway. Stand upright with your body braced, keeping one arm loose at your side. Use your other hand to grab the loose end of the Theraband. Pull the band away from the anchor at a slight angle; your shoulder should stretch slightly outward from your body. Bring the end back slowly and repeat several times. If your pain is present on both sides of your body, switch arms to ensure both sides receive a proper stretch. Depending on your physical state and pain levels, work through all of these exercises and try to increase your repetitions as your pain and mobility improve. Although some soreness is natural as you stretch, you should see gradual improvement in your neck with each exercise session. However, if your pain and range of motion do not improve, considering investing in professional care from a trained physical therapist. For questions concerning appointments and consultations, please contact us at 570-208-2787 or cawleyptfrank@gmail.com. We also invite you to visit our website and social media for more information.